End of Summer- Oven Candied Tomatoes! I get the most beautiful, small deliveries of produce once a week from a CSA here in Portland called Slowhand Farm. And, the tomatoes and peppers have been fantastic this year- juicy, sweet, and full of flavor. But, with me doing the GAPS diet intro (more on that maybe later), I haven't had a chance to just snack on them as I please. 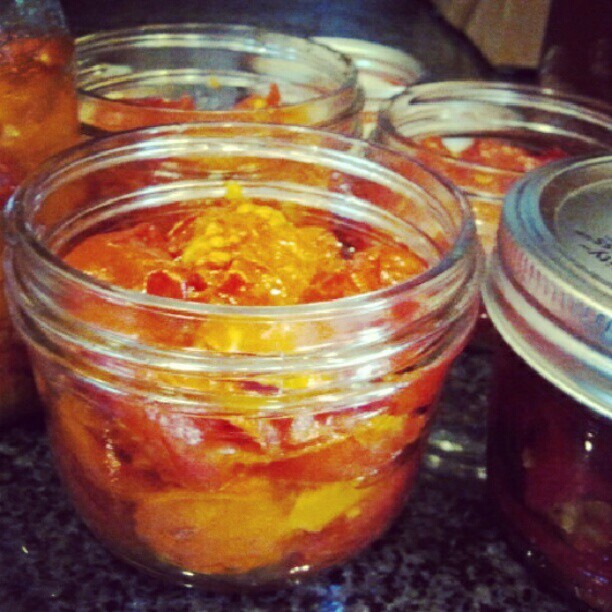 So, a need for delicious preservation led me to Lynne Rossetto Kasper's OVEN CANDIED TOMATOES!!! (Her website isn't that great for recipe layout, be warned.) The recipe, which uses no sugar but what comes from the tomatoes themselves is fantastic, and in the end you have two delicious condiments that can be frozen for at least 3 months--perfect for having a taste of late summer in the middle of winter! OPTIONAL VARIATIONS- pinch of red pepper flakes, sprig of rosemary, thyme, and/or add any banana, bell, or hatch peppers you may have, also chopped up. .In a half sheet pan, or two 2-1/2 quart shallow metal baking pans (not glass or enameled metal), arrange tomato wedges (and peppers) cut side up, about 1/2 to 1-inch apart. Brush tomatoes with oil — there should be enough to lightly film the bottom of the pan as well. Sprinkle with salt and any other seasonings. then lower heat to 350 degrees and bake another 30 minutes. Turn heat to 300 degrees, and bake 30 more minutes, or until edges are slightly darkened. If edges are not yet colored, turn heat down to 250 and bake another 10 to 15 minutes. Remove tomatoes from the oven. Cool 20 minutes. Transfer them to a shallow glass or china dish and pour their oil over them. Layer in a storage container (I used a wide mouth mason jar with plastic lid), pouring in their oil, and refrigerate. To serve, drain off all oil from tomatoes and offer at room temperature. Taste for seasoning. 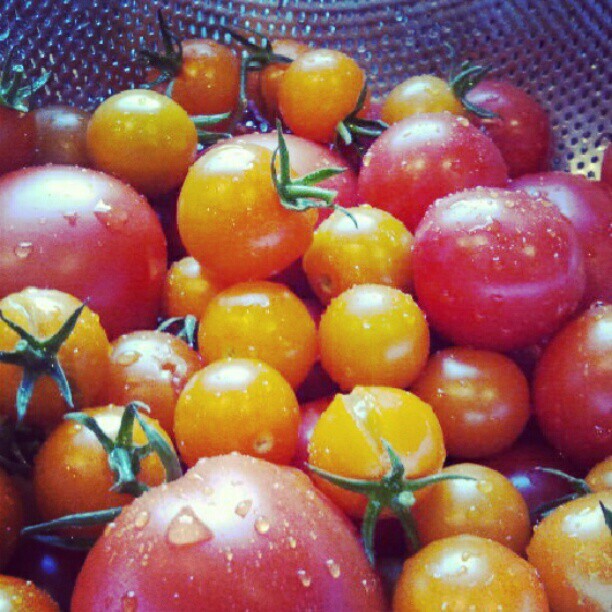 Freeze tomatoes in their oil in sealed containers up to 3 months. Thank you Splendid Table! And, Thank you even more for the delicious veggies Slowhand Farm!